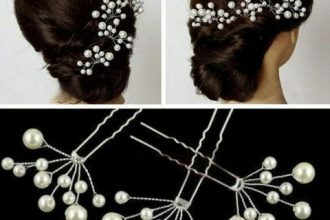 Every girl dreams of being a beautiful bride, and to complete that bridal look, hair accessories forms a major part. Ear chains is one such hair jewellery that gives a girl the most beautiful look that she desires for! 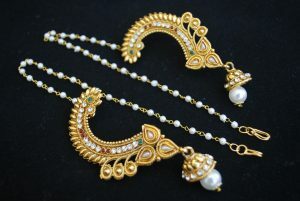 Adorn yourself with this multi line gold ear chain jewellery with your jhumkas to enhance your bridal glam! This exquisite multi line ruby studded gold ear chain along with ruby studded jhumkas adds more glam to your bridal hairdo! 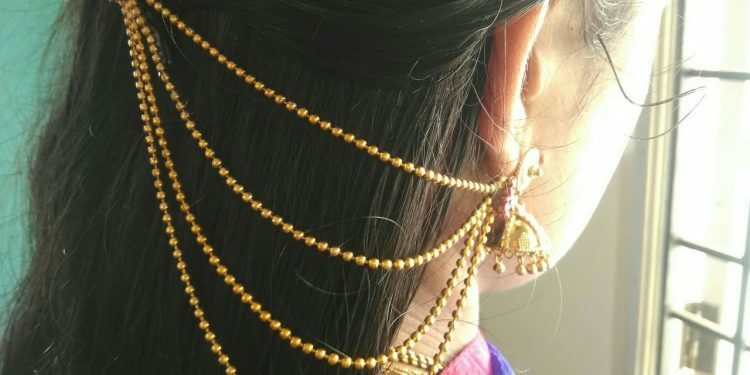 Lovely multi line pearl ear chains connected from jhumkas to center hair pin on your bun makes you look more glamorous on your special day. 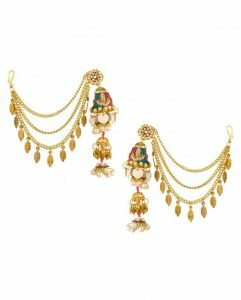 Pair of jhumkas with multi line ear chains having drops giving it antique look. Choose this traditional pearl ear chain with your matching pearl jhumkas or kundan earrings to make it look more graceful. Complete your ear and hair jewellery with this pair of pearl studded ear cuffs along with pearl ear chain. ©2017 All Rights Reserved. Dhanalakshmi Jewellers.